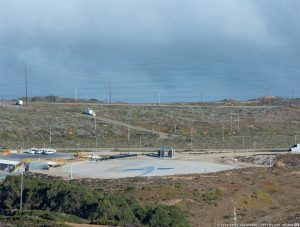 LOMPOC, Calif. — SpaceX continued its impressive rate of launch Sunday evening with the flight of the SAOCOM 1A Earth observation satellite from Vandenberg Air Force Base’s Space Launch Complex 4E. It marked the 17th launch for the company this year, with at least six more still on its manifest for 2018. SpaceX utilized a previously-flown Block 5 Falcon 9 first stage to launch the 6,613-pound (3,000-kilogram) payload. It was previously used to send the Iridium-7 mission into orbit. 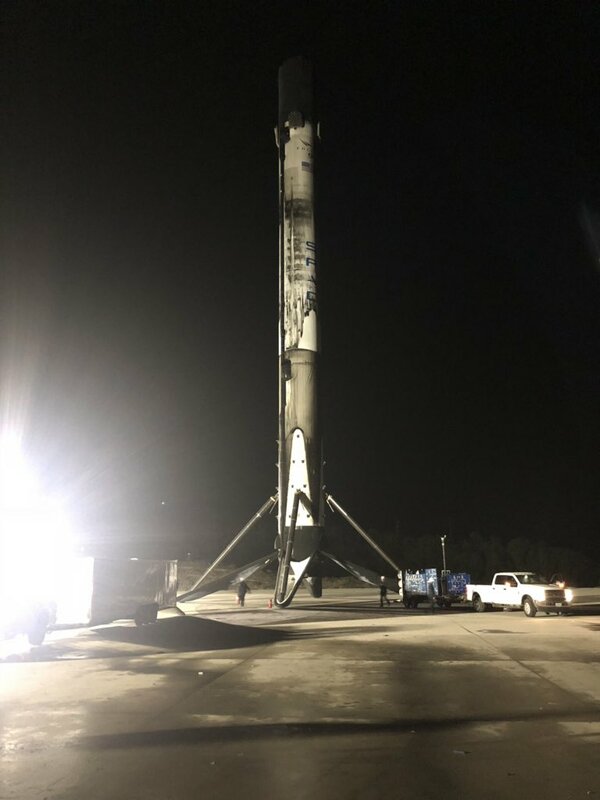 The Block 5 is the company’s newest variant of the rocket, debuting in May, and is characterized by its higher trust on all engines, improved landing legs and flight control systems. The launch occurred on time at 7:21 p.m. PDT Oct.7 (02:21 GMT Oct. 8), 2018. At about T-minus 38 minutes, SpaceX’s launch director gave the go-ahead to begin the process of fueling the 229-foot (70-meter) tall Falcon 9. A few minutes later, the RP-1 rocket grade kerosene fuel and liquid oxygen began flowing into the rocket. As the minutes ticked by, the rocket’s engines were conditioned for flight and the tanks finished filling with propellants. Just one minute before lifting off, the Falcon 9’s flight computer checked to ensure all was nominal for the mission to get underway as the propellant tanks were brought up to flight pressure. Fifteen seconds later, the launch director confirmed that the launch could proceed. The countdown reached zero and a bright orange-yellow flame lit up Space Launch Complex 4E. 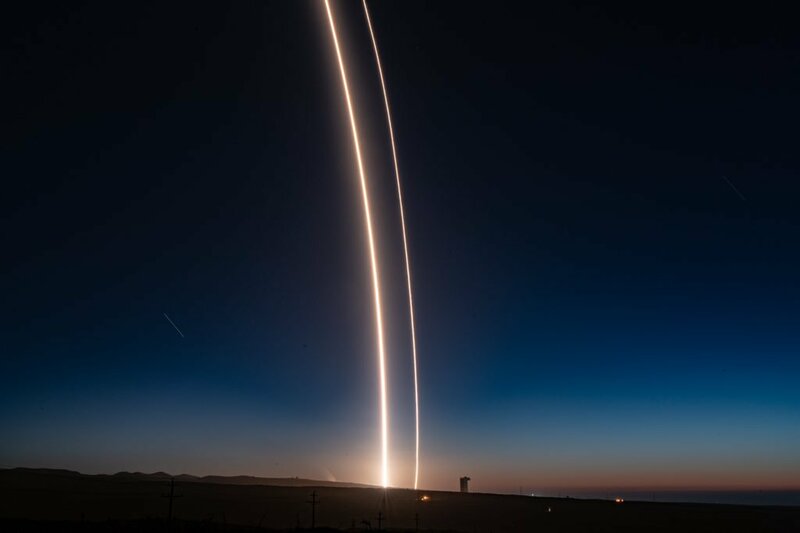 After lifting off the pad, the rocket arced out over the evening sky above California to send the SAOCOM 1A satellite on its way toward a Sun-synchronous orbit. Around a minute after leaving the ground, the vehicle reached “maximum dynamic pressure” the area of the flight where the pressure of the atmosphere being exerted on the rocket and its payload were under the greatest amount of stress—Max-Q. Some 2 minutes, 20 seconds into the flight, the nine first stage Merlin 1D engines finished their job of sending the second stage with the satellite toward orbit. Shortly thereafter, the first and second stages separated. 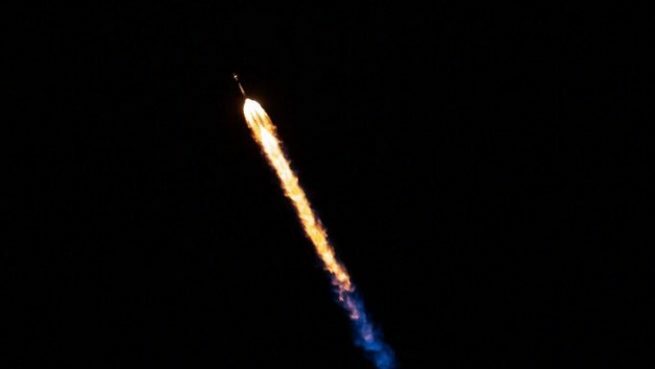 It was at this point that the Falcon 9’s second stage assumed the responsibility of powering the satellite on its way. Its lone vacuum-optimized Merlin engine ignited shortly after stage separation. About 3.5 minutes after leaving California, the payload fairing (the rocket’s nosecone) that shielded SAOCOM 1A through most of Earth’s atmosphere was jettisoned. About 10 minutes into the mission, the second stage cut off as planned, placing the satellite payload into orbit. Meanwhile, upon completing its part of the mission, the Falcon 9’s first stage continued on its suborbital trajectory, performing a boostback, entry and landing burn to safely touchdown on the surface of Landing Zone 4 (formerly SLC-4W), located just a quarter mile (0.4 kilometers) from the launch pad. It was a historic moment as it was the first West Coast return to launch site landing for SpaceX. Back in space, and after coasting for about 2.5 minutes, SAOCOM 1A was released into a Sun-synchronous orbit at about 385 miles (620 kilometers) in altitude at a mission elapsed time of about 12.5 minutes. The SAOCOM 1A spacecraft is a synthetic aperture radar Earth imaging satellite that will be operated by Argentina’s space agency, the National Commission on Space Activities. It uses an active L-band SAR polarimetric to gather information on soil moisture.